The Bulls is a short film written by Rod Lachlan, who also stars in it. Other than directing and producing the film, Eric also wrote the score. 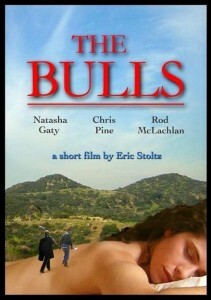 The Bulls premiered at the Wine Country Film Festival in August 2005. It is not available anywhere. In this short tale of murder and misguided manhood, Desmond (Rod McLachlan) assumes the role of father figure for Jason (Chris Pine), a young man whose real father is incarcerated. While Desmond’s heart may be in the right place, his advice is, to say the least, dead wrong. Misogyny, bigotry, and irresponsibility are the best life lessons that Des can offer as the two attempt to bury their sins.